What sporting events does the massive Game of Thrones audience actually compare to? While the Game of Thrones premiere didn't pass big NFL games or many Winter Olympics nights, it did come awfully close to MLB and NBA final-game ratings in 2018, and beat the Kentucky Derby, the Masters and more. 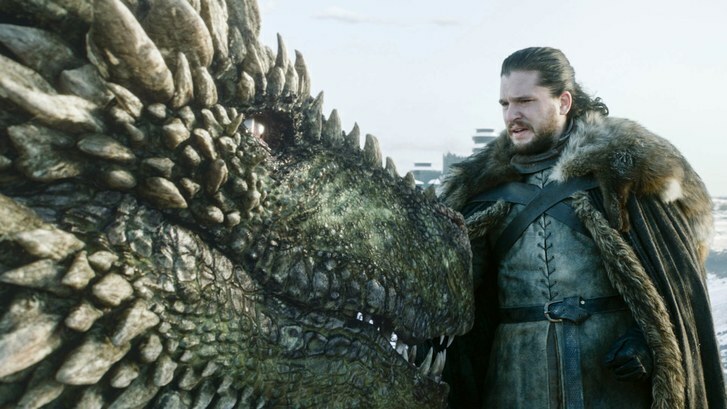 According to figures released by HBO, the Season 8 premiere drew 17.4 million viewers across all platforms (linear, HBOGO and HBO NOW), including 11.8 million who watched on the linear channel. And that is only those who watched Sunday night. Expect the total viewers to go up considerably once delayed viewing is factored into the final numbers. In an age of DVRs and streaming platforms and everything being on demand, live sports has been the kingpin of linear television as the most reliable audience driver. And while GOT numbers will continue to grow as those numbers are included, it’s an astounding number for the debut that really can only match up with live sporting events, at least when it comes to a cable television series on a premium channel like HBO. So what sporting events have drawn a similar amount of viewers? Of course pretty much every NFL game of note is going to surpass it, but you may be shocked at what’s in the same neighborhood or slightly below. Thanks to Sports Media Watch’s list of the Most Watched Sporting Events of 2018, here are some significant telecasts from 2018 that averaged around 17 million viewers. Those are some pretty huge sporting events! Overall, the Game of Thrones premiere was roughly on par with the NBA Finals and World Series. The 2018 NBA Finals were down in ratings compared to previous years with a sweep and the Cavs and Warriors meeting for the fourth straight year. It garnered an average of 17.5 million viewers. The World Series was down at an average of 14.1 million viewers for a five game series between the Red Sox and Dodgers. Most of the Winter Olympics telecasts would outrate GOT, although there were a couple nights later in the games that would dip below the threshold. With the proliferation of Netflix and other streaming services, there’s a case to be made that the Game of Thrones final season may be the last social viewing experience that we have where we all are glued to the same series at the same time. Ultimately, that’s the draw of live sports, isn’t it? There is no binge watching an NFL season or the Winter Olympics. It will be interesting to see if the GOT numbers can raise to even higher levels throughout its final season. Now if we could only get Cersei those elephants.